Previously, on MinerBumping... Highsec carebear johantttt was driven to anger when he witnessed Agent KrazyTaco bumping his fellow miners. At his wit's end, johantttt attempted to suicide gank him using a fail-fit Drake. johantttt lived in highsec all his life, but he managed to pick up the "I didn't want that ______ anyway" excuse. Now for a shift in perspective. I was not aware of these events as they were going on. 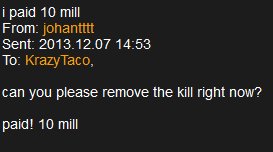 From my vantage point, a random player EVEmailed me a warning about KrazyTaco. I was able to immediately dismiss the warning, however. I knew KrazyTaco was a Code enforcer. 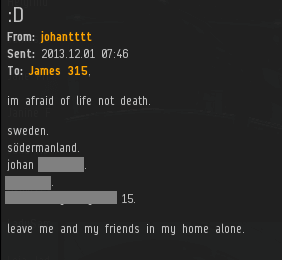 The next day, I was perplexed to receive another EVEmail from johantttt. Out of nowhere, he gave me his full name and street address. A few days later, johantttt set me to neutral. I was sure there was a perfectly reasonable explanation for all of this. It's always fun when carebears think it matters that they have kill rights on a -10 character. But now an Agent was the one with the kill rights, and johantttt was obsessed by it. He couldn't mine, because at any time, someone could buy the kill rights and kill him. johantttt demanded that the kill right be thrown away somehow. johantttt > how can i mine when you sell kill rights? With his mining operation in jeopardy, johantttt was desperate. He offered to raise 60 million isk and purchase the kill rights himself. But KrazyTaco insisted that he be paid first, rather than allowing johantttt to mine minerals for the 60 million. Thwarted, johantttt suffered a relapse. KrazyTaco > Morning johan, you rang? 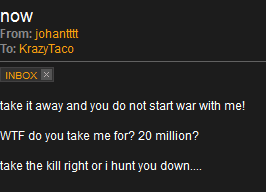 johantttt got into another Drake and demanded that KrazyTaco activate the kill rights and duel him. johantttt didn't really care about the outcome of the duel; he just wanted to be free to mine again. johantttt > ohh where si your brain? ! However, KrazyTaco's terms stood. He declined to activate the kill rights. Later, johantttt began to reconsider his status as a rebel against the New Order. He realized that he didn't know exactly what he was rebelling against. Whoever the New Order was, they were powerful enough to stop him from mining. Having read the Code, johantttt started to change his mind. Maybe the New Order wasn't so bad after all. A few days later, KrazyTaco replied, assuring the carebear that he could be redeemed if he followed the Code. Then he would be welcomed into the New Order family. The kill right acted as a sword of Damocles over the poor miner. He wanted to pay for the permit, but he couldn't risk mining anywhere outside of 1.0, or in anything more expensive than a Venture. Despite having played EVE for two and a half years, he was flat broke. 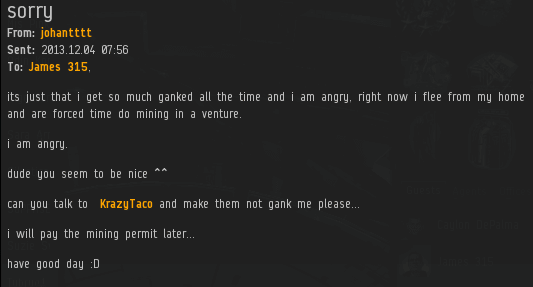 Finally, johantttt scraped up the cash to buy a mining permit, and KrazyTaco agreed to sell the kill right for 20 million isk. So the story had a happy ending. Judging by his bio, johantttt has yet to fully embrace the Code, since there's no pledge of loyalty to me (yet). Still, giving money to an Agent and apologizing to everyone is a good start. No matter how bleak a miner's prospects may appear, the New Order is always willing to give someone a fresh start. What a heartwarming story! I look forward to the day that johanttt decides to give up his live on violence towards innocent asteroids and takes up embracing the code! I look forward to the day that johantttt decides to visit a therapist. i told him to get me a priest, and i gave a movie to the priest: dantes inferno! Yes, thank you for pointing out that he should regard this knight as his 'pop', or father, bringing him wisdom to lift him up in this happy holiday season. Perhaps johan will purchase a new ship, even a popemobile, for the pope/knight.